Roman Martyrology: At Jazlowice in Ukraine, the Blessed Marcellina Darowska: her husband and eldest son dead, herself given to God and always attentive to the dignity of the family, founded for the education of girls, the Congregation of the Sisters of the Immaculate Conception of the Blessed Virgin Mary. She was proclaimed blessed on October 6, 1996 in Piazza S. Peter’s in Rome by her compatriot, Pope John Paul II. Marcellina Darowska was born on January 28, 1827 to Szulaki in Ukraine, the fifth of eight children of Jan and Kotowicz Maksymilia Jastrzebska, wealthy landowners. She grew up in the typical environment of the Lords Campaign, and its Szulaki city was then under Russian occupation who wanted to destroy the Polish cultural heritage at any cost, causing the closure of the seminaries and convents of the Catholic Church which they persecuted. Darowska made her First Communion at 10 years and at 12 was sent to Odessa for schooling; still in her early childhood blossomed the desire of a consecrated life after studying for three years she returned home and taken to help her father in the management of the farm. Not being able to satisfy her desire for lack of convents around and some opposition from her father, she left the farm for several years, promising to order the father to form a family. At 21, she agreed to marry Karol Darowski possessing the landowner Podolí (the historical region of Ukraine, at that time divided between Austria and Russia), but the marriage could celebrate after only one year because Marcellina who had to bow to the insistence of her father, she reacted with a painful leg paralysis and a general weakening of the body, reducing her nearly to death. After weeks of illness and recovered on October 2, 1849 she married Karol Darowski always for obedience, nevertheless, was an exemplary wife and marriage were born two sons, Joseph and Carolina. Unfortunately, three years after her husband died of typhus and a few months later her son Joseph died, a widow at 25 years, promising to the Virgin Mary by a vote of no longer belonging to any creature, and for her health traveled first to Berlin, then to Paris and April 11, 1853 was in Rome. Here, in 1854, she became aware of the Servant of God Karska Josefa (1823-1860) with her clasping a solid friendship and putting themselves under the spiritual leadership of her father Jerome Kaysiewicz, resurrection, (congregation founded in Paris in 1836 by three Poles emigrated, P. Semenenko , B. Janski and the same Kaysiewicz G.), the two were about to found a religious institute, whose purpose was to prepare the youth of women in society, especially those of higher classes. On May 12, 1854 Marcellina Darowska spoke privately her vows of chastity and obedience before the father Kaysiewicz. She took time to return to Poland to accommodate the future of her daughter Carolina and two months after the premature death of her Karska, December 10, 1860 she returned to Rome, then the Congregation of the “Sisters of the Immaculate Conception of B. V. M.” Fruit of common Giuseppa Karska and Marcellina Darowska, had just four sisters. Sister Marcellina had the votes on January 3, 1861 in Rome, assuming the role of the Superior of the new congregation; her efforts to transfer more Tesero the congregation in Poland, in November 1861 she returned to his homeland and having witnessed the death occurred in few months of her parents, chose a way for the founding of the first Jazlowiec a convent in the diocese of Lviv, in 1863 the last nuns left Rome. 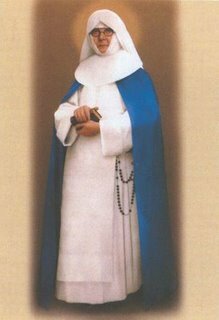 Conducted with prudence and energy for over half a century her congregation, becoming the soul, in 1863 she received the Order of praise, in 1874 the decree of adoption in 1889 were approved by the Constitutions she completed. Over the years the houses grew and included a middle school with day care and elementary schools also were small establishments open free for the poor people, such as kindergartens, vocational training and supplementary education. In its schools were trained generations of women wise and courageous to know and love God by following his commandments, loving your neighbor and fulfilling their duties. Marcellina Darowska after having suffered for cardiocircolatori disorders and drastic headaches, which made heavy her normal activities, died Jan. 5, 1911, leaving six Jazlowiec Properties and 350 nuns, who are currently employed in Belarus and Ukraine. This entry was posted on Monday, January 5th, 2009 at 6:22 pm and is filed under Beatified by John Paul II, Catholic. You can follow any responses to this entry through the RSS 2.0 feed. You can leave a response, or trackback from your own site.